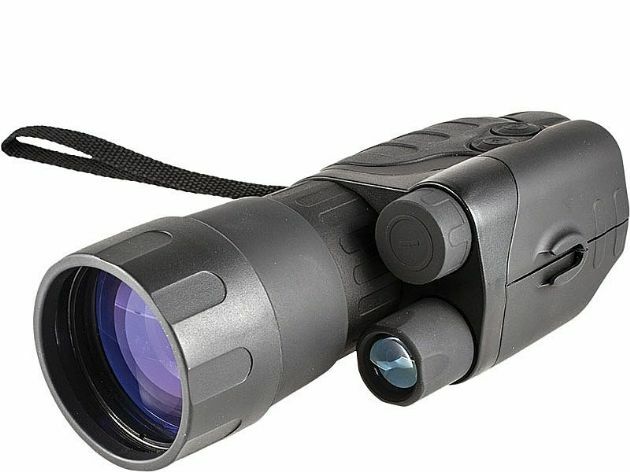 The Yukon NVMT Spartan G2+ 3x50 features a high performance EPM66G-2 Gen 2+ image intensifier tube and the increased sensitivity, lower distortion and greater resolution provides significantly improved performance over Gen 1 and CF-Super devices. It has a tactile sure-grip black ABS plastic body-shell with partial rubber armouring for added protection and hold. The optimum 3.0x magnification and a 14.5° field of view are ideally suited to scanning large areas quickly and accurately. Featuring a built-in IR illuminator to enhance performance and allow use in low-light and total darkness, there are also twin ¼” Whitworth threads built-in to the base of the unit to accept tripods, or secure an array of optional accessories to enhance performance and function. Switches come easily to hand and twin operational status LED’s illuminate green and red depending on the active functions and alert the user, should the device be accidentally switched or left on. Powered from a single 3v Lithium CR123A battery (not included), the NVMT Spartan G2+ 3x50 is robust, versatile and performs well in cold weather conditions. Each unit is individually serial numbered and is supplied with a secure detachable wrist strap and soft carry case.